Since June 2009 that Gossip-tv.gr went live, it has been established as a top choice as confirmed by the 253,159,778 visits made to date and the 1,380,059,775 page views by users who choose Gossip-tv .gr for their information about Greek showbiz and lifestyle scene. 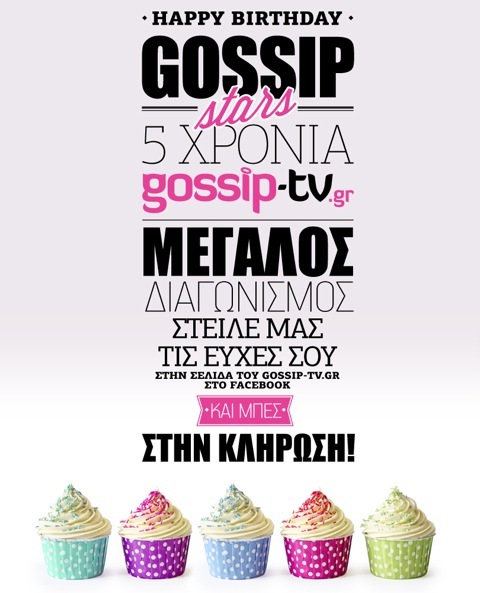 Gossip-tv.gr, celebrating five years of life, wants to thank its millions of visitors through a big contest on Facebook, giving gifts to all the readers who have trusted and continue to trust it. DPG Digital Media commits to the promise that Gossip-tv.gr will continue to improve every day with a focus on the information, entertainment and enjoyable browsing of the millions of visitors to its pages. Ματθίλδη Μαγγίρα Give me five! Πέγκυ Ζήνα Give me five! Δέσποινα Καμπούρη Give me five! Λάουρα Νάργες Give me five! Κλέλια Πανταζή Give me five! Μαρία Μπεκατώρου Give me five! Ιωσήφ Μαρινάκης Give me five! Γιάννης Πλούταρχος Give me five! Κατερίνα Στικούδη Give me five! Χριστίνα Παππά Give me five! Γιώργος Λιανός Give me five! Γιώργος Τσαλίκης Give me five! Πηγή Δεβετζή Give me five! Άννα Πρέλεβιτς Give me five! Τρύφωνας Σαμαράς Give me five! Θέμης Γεωργαντάς Give me five! Δημήτρης Ουγγαρέζος Give me five!